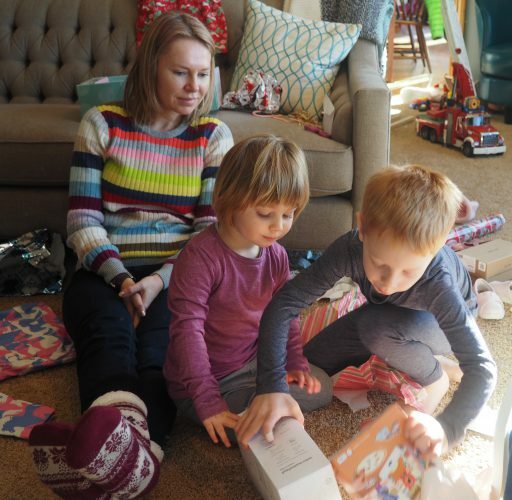 Lily and Jamisen are at such fun ages for Christmas; Santa is completely magical and unwrapping presents is a blast. 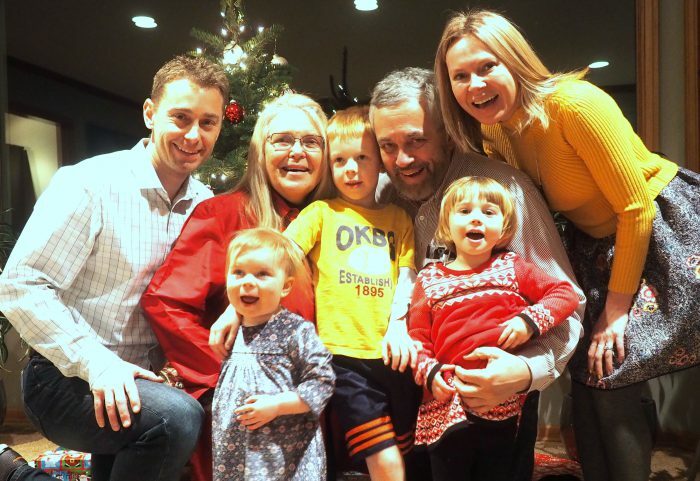 My niece Alise (the additional kiddo in the family photo above) is now over two years old, so all the kiddos share in the Christmas excitement. Kids really make the holidays fun, don’t you think? 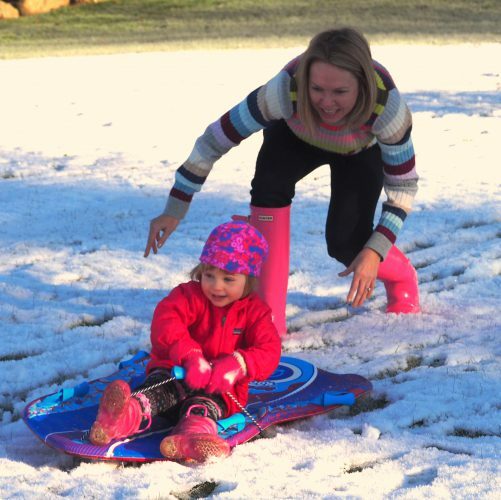 We also magically kept a light dusting of snow in the neighborhood so were able to sled today too. Lily’s Grandma (my Mom) is Norwegian and Lily showed that side of her genetics today, staying outside to sled, bird-watch and play in the snow long after her brother had gone inside to get warm. It was a wonderful Christmas day that went on all day long. The kids are at the age where they opened one gift and then played with that one gift for a while before opening the next one. 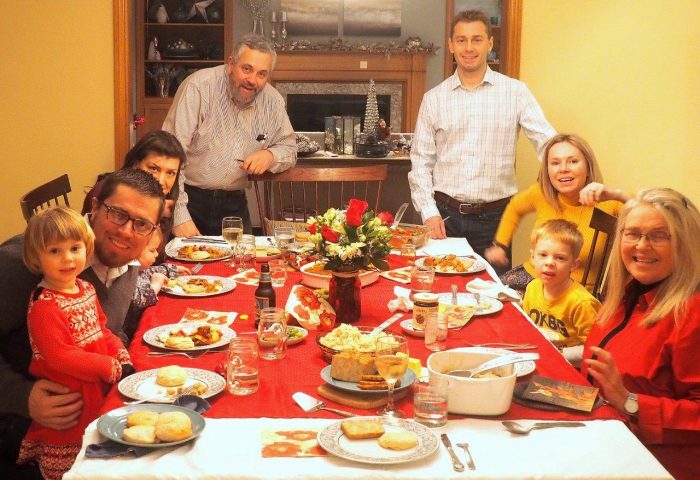 Because of this, Christmas morning felt long and drawn out all day … because, it was (!). The big hit gifts were a Lemonade stand for Jamisen and a “Stella” baby and crib for Lily. It was my favorite Christmas yet; the snow was so festive and fun and the kids were super fun to play with. I feel so thankful for all of the blessings in our life: health, our family, good food, meaningful work, friends, and the luxury of spending a day focused on love, laughter and relationship. A big thank you to all the Bramble Berry customers that made this year such a success. ❤ PS – Our office is closed today and tomorrow, but will reopen on Tuesday. Our website is open for orders 24/7. I don’t want to inspire panic…but there are 62 days until Christmas. In other words, Christmas Eve is exactly two months away. If you’re the type who runs to the mall the week before for gifts, you have plenty of time. But, if you’re planning on giving handmade gifts this year, it’s time to start crafting…yay! 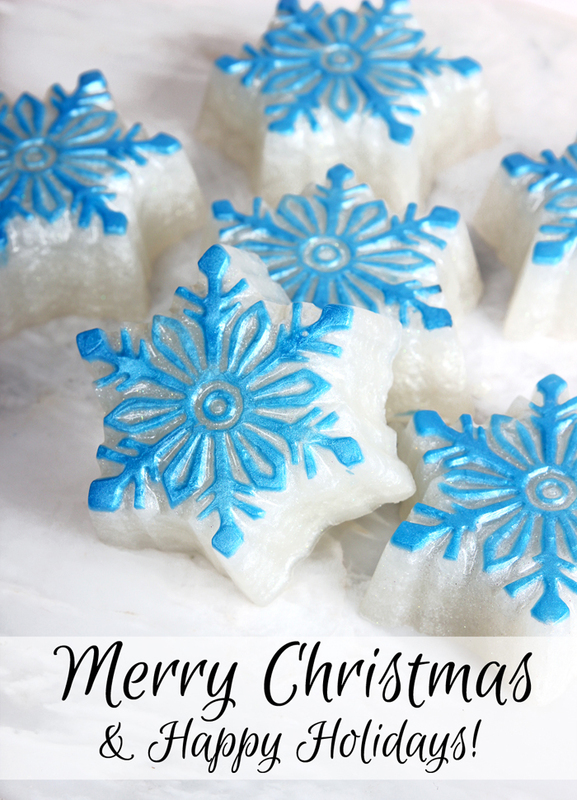 Planning on giving cold process soap this year? Soap made by the beginning of November will be fully cured just in time for Christmas or Hanukkah. If the soap has a water discount, you give yourself a bit of wiggle room. 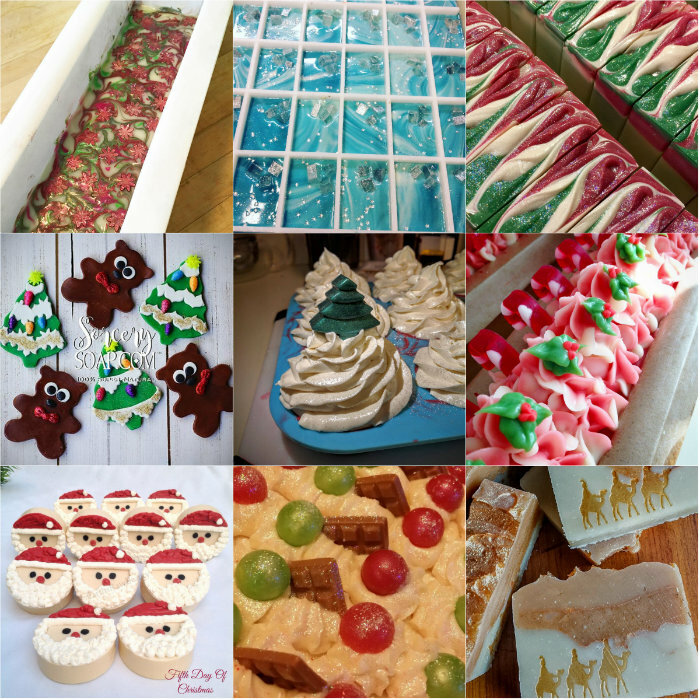 =) Below are a few of my favorite holiday-inspired cold process soap tutorials. 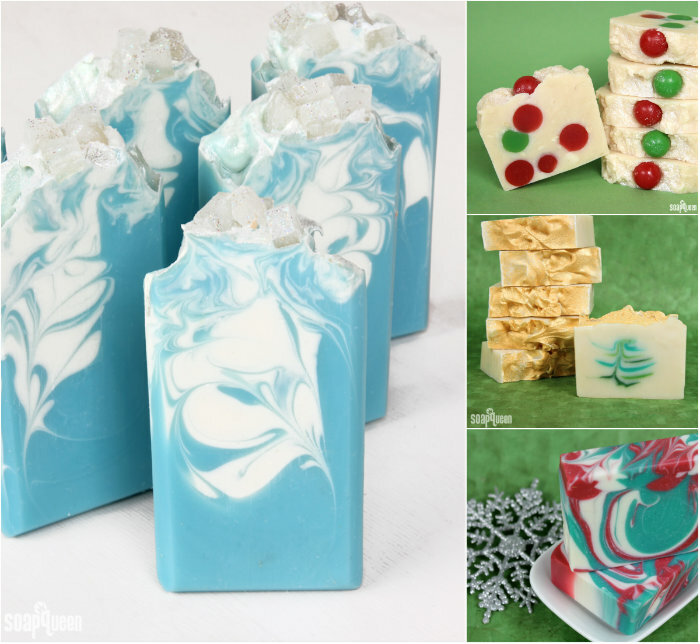 But of course, keep in mind your soap doesn’t have to be holiday themed. 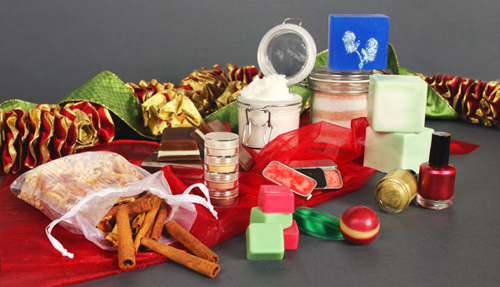 Creating soap made with your recipient’s favorite scent or color is a great way to make them feel extra special. 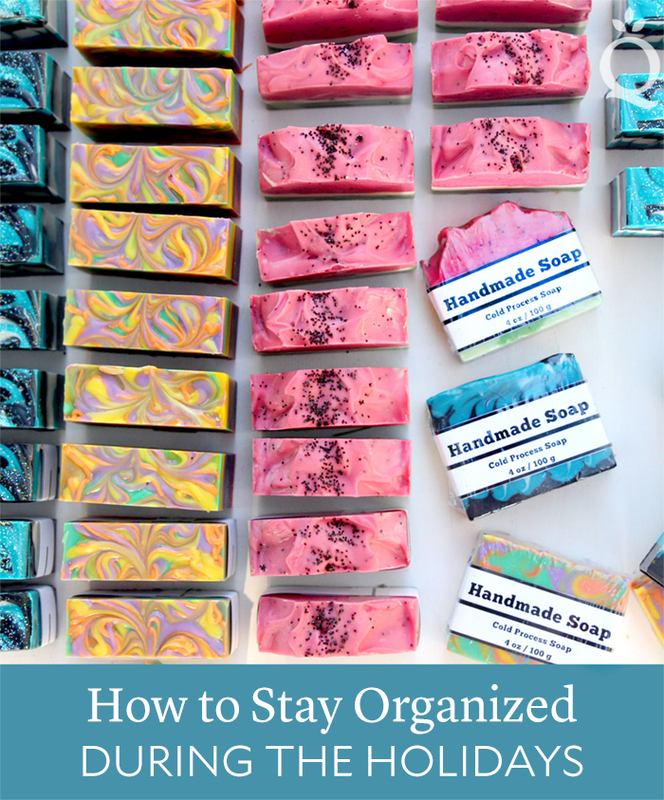 If you have a lot of gifts to give, the Cold Process Soap Wedding Favor Tutorial shows you how to make 72 guest-sized bars in one batch. Switch out the pink colorant for red or green for a festive look. Bundle several bars in a gift bag, or give each bar individually. These little bars make great stocking stuffers or gifts for a teacher, doctor, or mail carrier. If you have a lot of gifts to give, this tutorial makes 72 bars in one batch! If you make melt and pour soap, time is on your side because melt and pour doesn’t require any cure time. And with so many design possibilities, you’re sure to find the perfect melt and pour project. 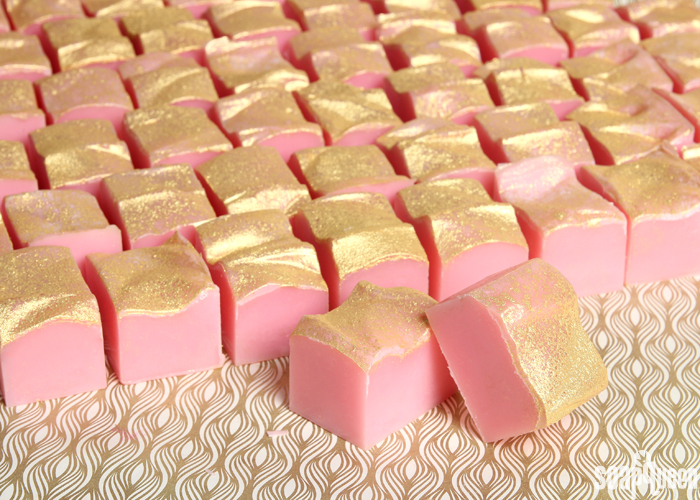 For the person who appreciates sparkle and shine, melt and pour soap gems would be right up their alley. Learn how to make emerald and amethyst soap in this Soap Queen TV video, then check out the Sparkly Garnet Soap Gems Tutorial. If you’re looking for an easier project, the DIY Sparkling Bath Crystals would make a great gift as well. 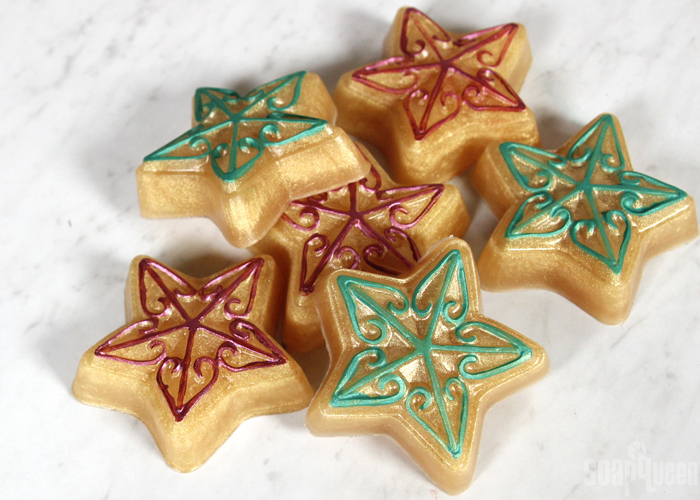 If you prefer something more natural, the Star Anise Melt & Pour Soaps are made with natural colorants and essential oils. Anise stars and cinnamon sticks are placed on top for a finishing touch. The Minty Clay Melt & Pour Bars contain poppy seeds for exfoliation, along with activated charcoal, green zeolite clay and spirulina powder for color. 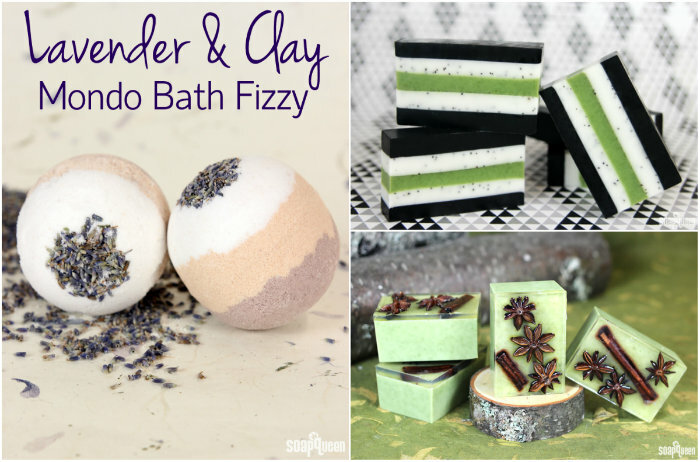 The Lavender & Clay Mondo Bath Fizzies are made with clays and Lavender 40/42 Essential Oil for a calming scent in the tub. During the holidays, I love to fill my home with a warm and comforting scent. Pre-children, you could always find several candles and wax tarts in my living room. =) But toddlers + open flames = nothing good. So this year, I found myself reaching for scented pine cones at a local craft store. 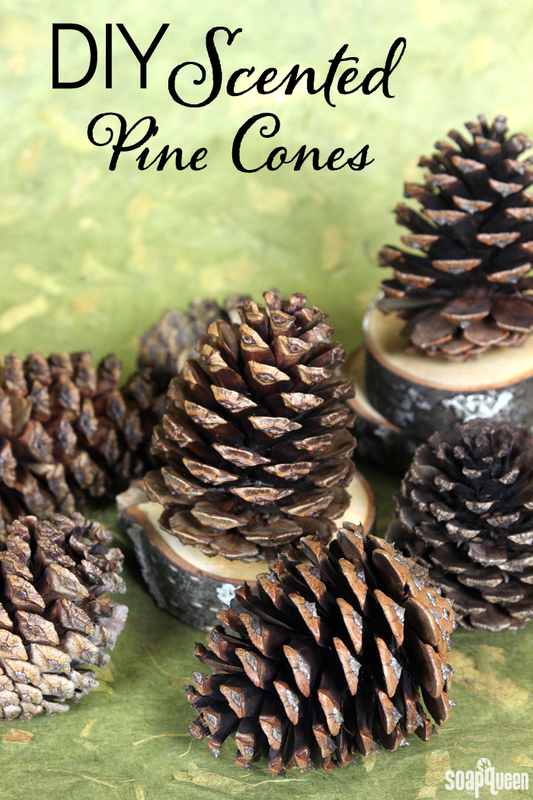 Then it hit me…why not create scented pine cones with my own custom scent? 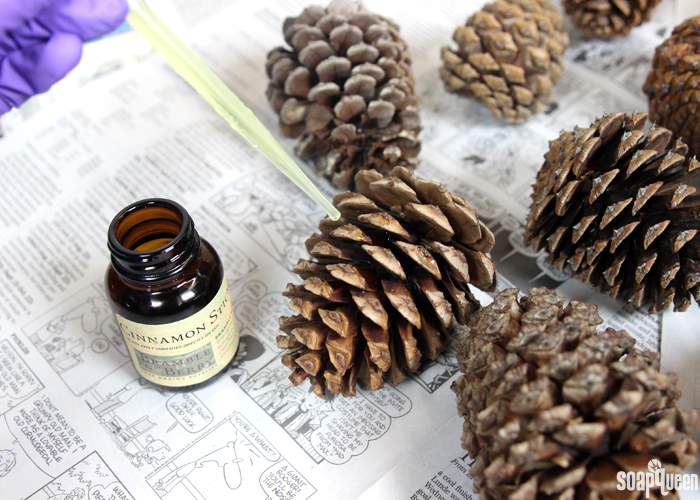 As it turns out, scented pine cones are extremely easy to make. 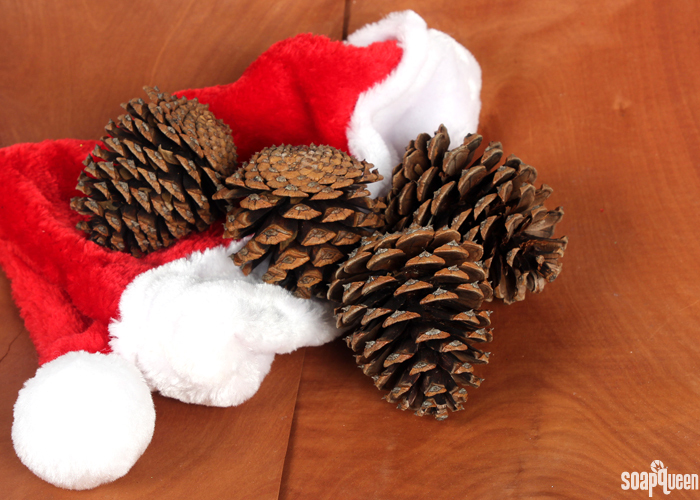 All you need are pine cones, fragrance, droppers and gloves. Scented pine cones at the craft store are usually scented with cinnamon. I love making them myself because I can customize with my favorite fragrance. I scented half of these pine cones with Cinnamon Sticks Fragrance Oil for a spicy and sweet scent, and half of the pine cones with Christmas Tree Cybilla Fragrance Oil for a classic Christmas scent. They smell absolutely amazing together! Half of the pine cones are in a bowl as a centerpiece in my living room, and the other half are nestled into my tree for extra scent. Have you started crafting for the holidays? They will be here before you know it, so now is the time! In particular, if you’re planning on making soap for holiday gifts…start soaping! 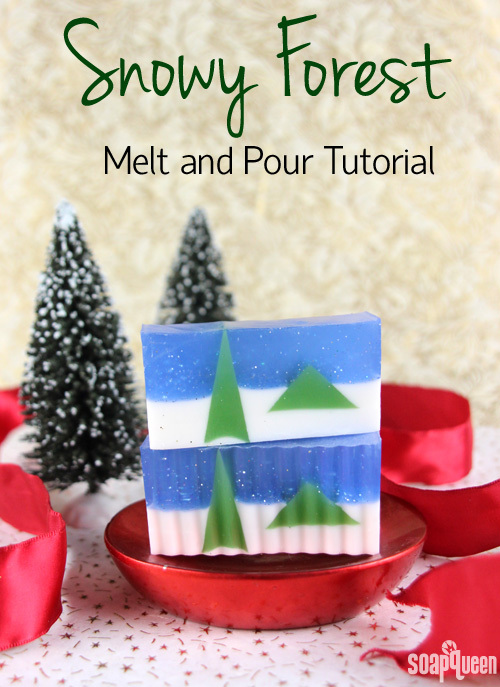 =) Today I’m switching gears from soap to a fun DIY project that will fill your house with Christmas cheer. 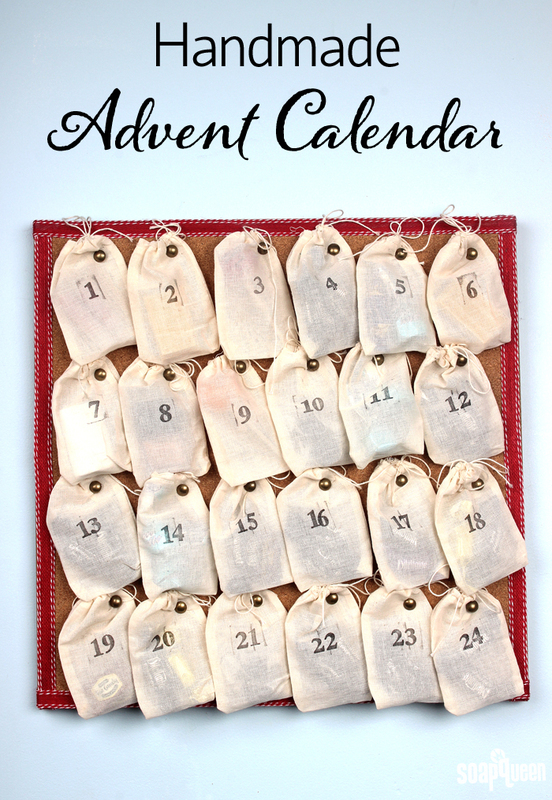 If you’ve never counted down the days until Christmas with an advent calendar, they are a fun way to build excitement and anticipation! In particular, kiddos love opening a small surprise everyday. The winter months are notorious for dry and cold air, which can cause extreme skin dryness and flakiness. During this time, skin needs extra moisture to stay comfortable and hydrated. If your skin needs additional TLC during winter, these Gingerbread Lotion Bars are made with a combination of extremely skin-loving oils and butters. Cocoa butter and coffee butter in particular are excellent for creating a barrier that helps your skin retain moisture. They also smell amazing! Combined with Cinnamon Sugar Fragrance Oil, these bars leave a sweet and spicy smell on the skin. To help the adorable features on the gingerbread man pop, the bars are “painted” with Copper Sparkle Mica mixed with 99% isopropyl alcohol. The alcohol dries, leaving behind lines of sparkly mica. For the first few uses, the bars will give your skin a light sparkle. If you love the Gingerbread Man Mold as much as I do (it’s so cute! 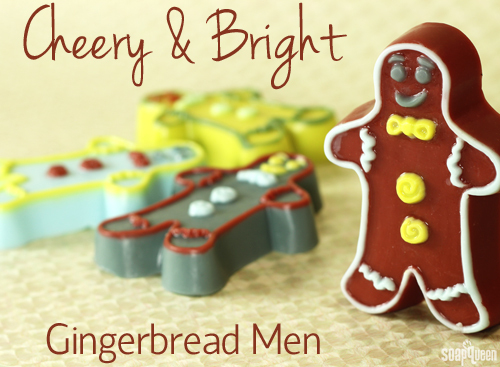 ), check out the Cheery & Bright Gingerbread Man Melt and Pour Tutorial. 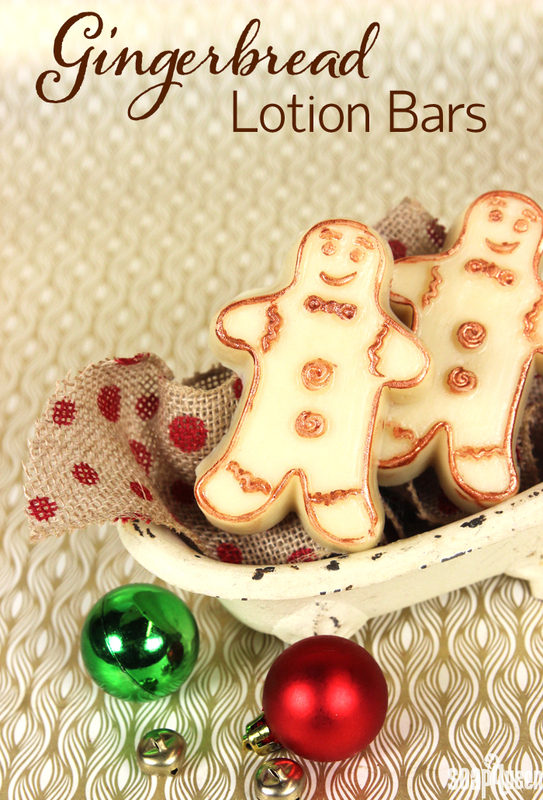 If you prefer classic holiday colors, the video below shows you how to make adorable gingerbread man soaps. They make perfect gifts for friends and family. Packaging and shipping lotion bars can be a little tricky because they are extremely heat sensitive. I recommend keeping these bars in a dry, cool place. If the bars come in contact with heat, they can melt. For tips on shipping during warm weather, check out this post. This box template is the perfect size for the adorable Gingerbread Man Mold. Simply print out the template on plain paper and use the template to trace onto cardstock. You can also print the template directly on cardstock if your printer will allow. Then, fold up the cardstock to create a perfect box for showcasing your gingerbread man creation! You’ll want to line the bottom of the cardstock box with freezer paper to prevent the gingerbread lotion bar man from getting the box all oily. Also, this box won’t hold oil, in the event you ship to someplace extra hot that melts your little gingerbread man lotion bars in transit. With Thanksgiving behind us, the countdown to Christmas has officially begun. If you’re feeling a little behind in holiday gift preparation, don’t fret. There is still some time to create unique, handmade gifts for your family and friends. But don’t wait, it’s time to get crafting! 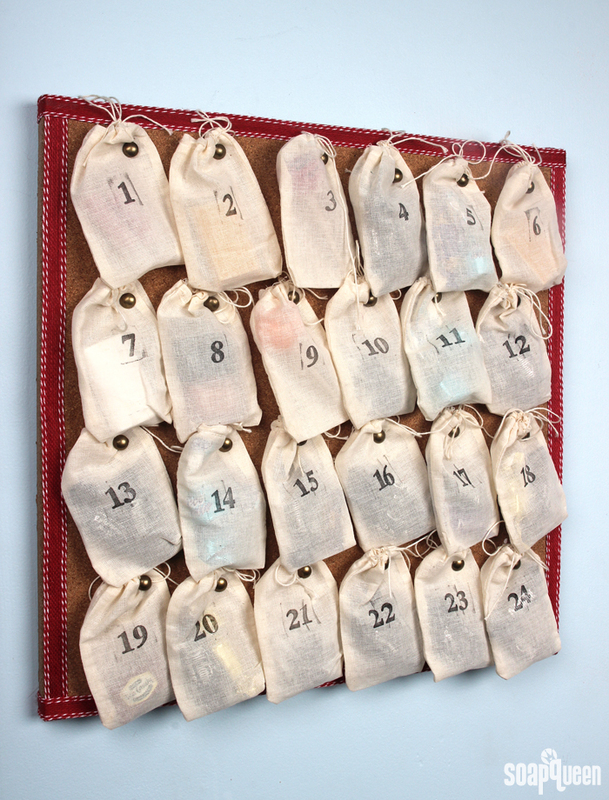 The 12 Days of Christmas series featured twelve easy to make projects that would make fantastic gifts. From melt and pour and wax tarts to lip scrub and nail polish, you are sure to find a gift option for everybody on your list. Looking for packaging inspiration? Check out the Packaging Inspiration video on Soap Queen TV, along with the #Make it Monday: Packaging photo gallery on Facebook. The holiday season will soon be upon us. With only 44 days until Christmas, now is the perfect time to start creating homemade gifts. 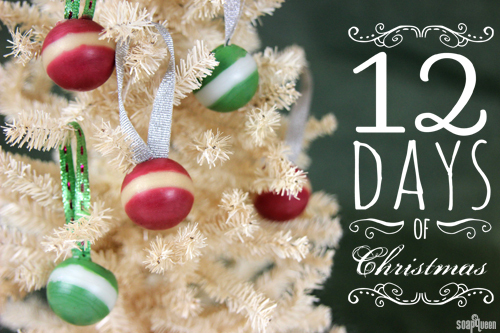 Starting today, keep your eyes on the blog for 12 days of consecutive holiday inspired tutorials. All the projects are easy to make and even easier to give! 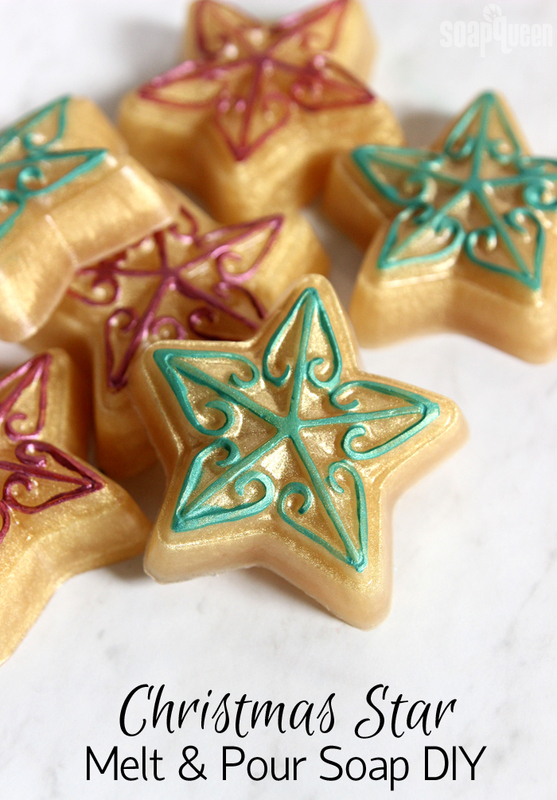 To kick things off, these Scented Beeswax Ornaments are the perfect addition to your Christmas tree. Scented with Woodland Elves Fragrance Oil, these ornaments smell like a fresh pine, clove and juniper. If you have a fake tree this year, these ornaments are a great way to bring the fresh Christmas tree scent inside! Soapy inspiration can come from a variety of different sources. From places and design to scents and colors, possible influence is everywhere! For this adorable gingerbread man project, inspiration came from a colorful yet slightly festive color palette via Design Seeds. With a deep burgundy, bright green and icy blues, this color combination is a fresh take on the holidays! Achieving these unique colors requires mixing both liquid and powder colorants. The end results are worth the extra effort; these shades are a great combination of cheerful, sophisticated and festive. Scented with a delicious smelling combination of Almond and Cinnamon Sugar Fragrance Oils, these cute gingerbread men smell good enough to eat. Just don’t forget to add the Vanilla Color Stabilizer to prevent vanilla discoloration! If you’d like to create a more traditional gingerbread man soap, check out this Soap Queen TV video. You can also download this free box template to package up your cute creation for the holiday season. The past two weeks, the holidays came early with a series of festive projects and tutorials. Even though the holidays seem far away, making handmade gifts takes a lot of time and planning. This is the year to plan ahead and have a stress-free, handmade holiday! 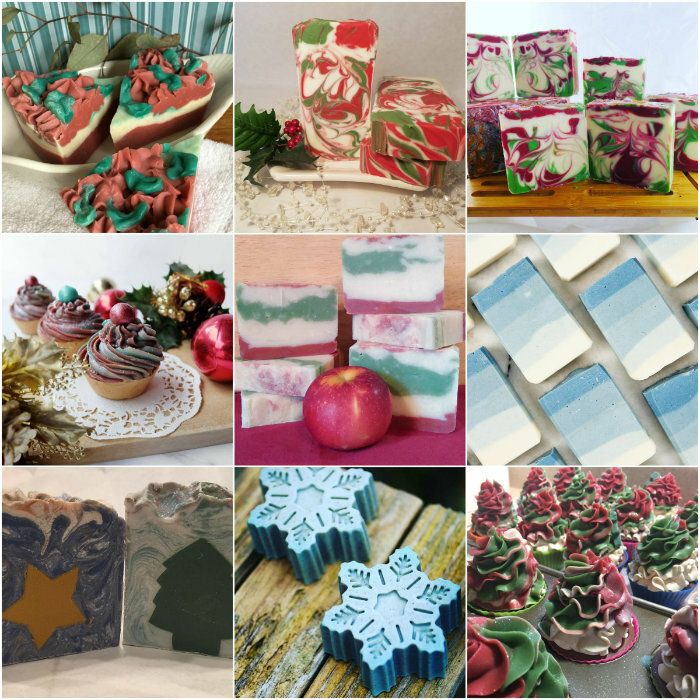 Handmade cold process soap makes a fantastic gift. Everybody loves the beautiful designs, fun colors and skin loving properties. 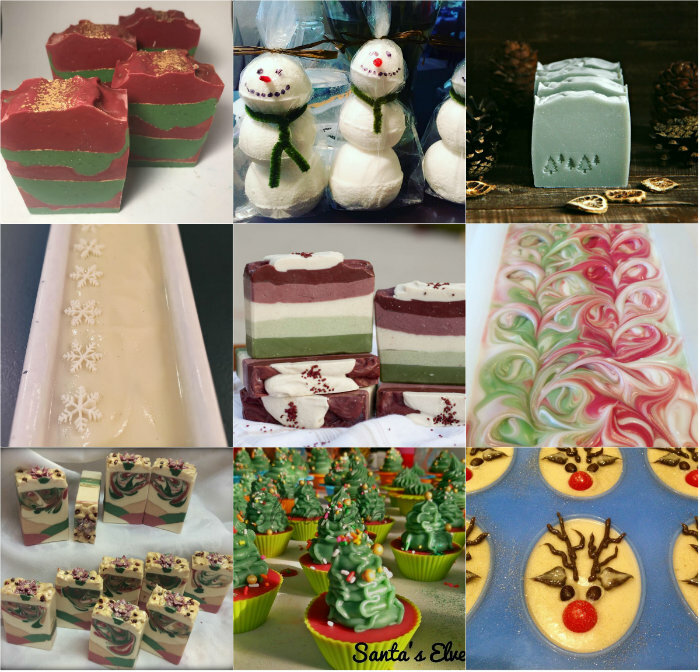 Because many people have never experienced handmade soap before, it’s extra fun to give! This festive Christmas Tree Swirl Cold Process features a reverse hidden feather swirl, made popular by Handmade in Florida. 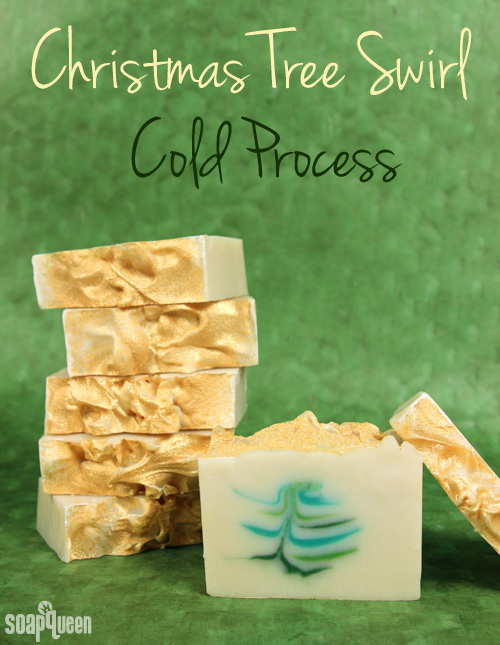 Topped with Sparkle Gold Mica, this cold process project would be perfect under the tree. 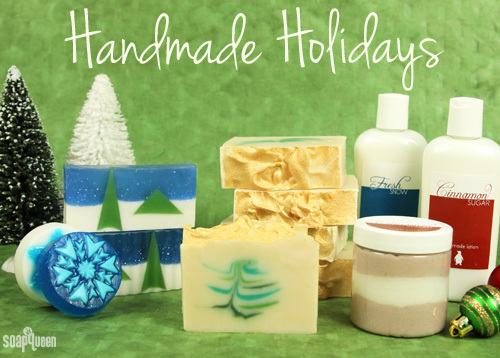 Cold process soap requires a four to six week cure time, making now the optimal time to create soap for the holidays. If you are looking for more holiday project ideas, check out the Handmade Holiday Gift Inspiration post. From lip balm to melt and pour, there is a gift for everybody on your list. On a cold day or night, there is little better than snuggling up on the couch with a book and a warm drink. 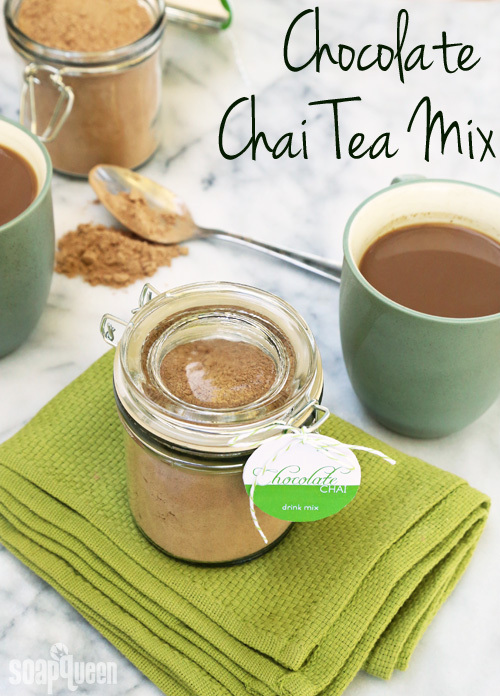 Sweet, spicy and o’ so comforting, chai is a favorite treat of mine during fall and winter. Unfortunately chai can be expensive, and chai tea lattes contain a lot of sugar (a Starbucks chai tea latte packs in 42 grams!). Luckily, recreating chai tea lattes at home is easy. Made with a combination of milk powder, spices and instant tea, this chocolate chai mix cuts back on the sugar content while saving money.